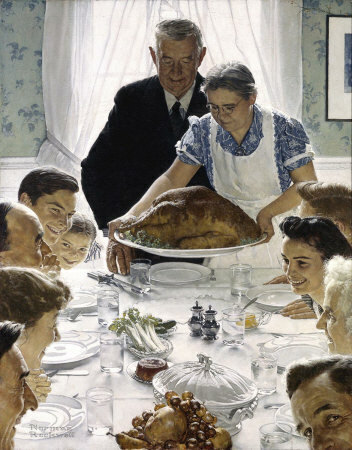 This image from Normal Rockwell is still the perfect Thanksgiving image in my opinion. Lots of happy people around a table together. I hope you are having a picture perfect Thanksgiving today. This month I have a ton of giveaways, a lot more than usual, running on the blog. Hopefully you will win something great and know it is a thank you from me for reading this blog. Thank you to all of you. You are the best! And if you were waiting for the Silhouette discount info, use BEDIFFERENT at check out on Black Friday (12:01 MST) to get 40% off everything in the store. You won't find any Silhouette CAMEOS in the store though. You have to to go to the super secret Silhouette CAMEO Black Friday Site HERE and use the same discount code to get the CAMEO for $249.99. May you have a Norman Rockwell-style Thanksgiving! Thanks Lissa. It is in the works! We are all hanging out watching the Macy's Day parade. It is heavenly! When the Norman Rockwell exhibit was at Atlanta's High Museum, we were told by a docent that Rockwell never worked from photographs and insisted his subjects pose while he painted. She said the woman with the turkey platter was so exhausted after holding it for hours on end that she had a fatal heart attack soon after the session was over. Although the setting looks like one big happy family, the facts are that they were simply chosen for this seasonal masterpiece. I'll never view it the same way after learning these facts.